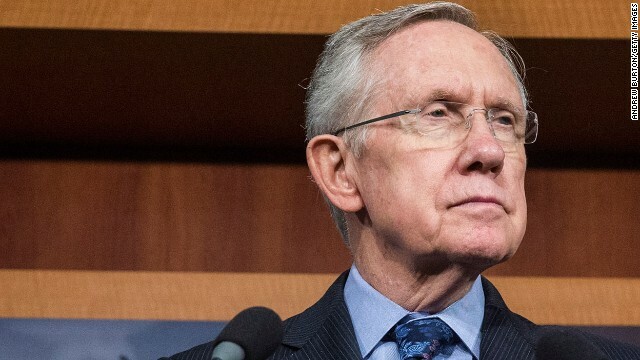 (CNN) - Capitol Police in Washington said they are investigating threatening statements made against Senate Majority Leader Harry Reid. Police would not provide additional information other than to say it's an ongoing investigation. A spokesman for the Nevada Democrat declined to comment. Reid, who has a permanent security detail, is a sharp-elbowed politician who is outspoken on many topics and often clashes openly with conservatives on issues from Obamacare to budget matters. But a congressional source said the threats started after Reid made sharply critical comments about supporters of controversial Nevada ranger Cliven Bundy, at one point calling them "domestic terrorists." Bundy was locked in a high-profile and protracted land dispute with the federal government. Last week, he drew widespread scorn for making racially insensitive comments. Not condoning it but you can't just insult a group of people, not listen to their grievances, lord over them like you don't have to answer to them and not expect a reaction. Do we have to "listen to their grievances" when they don't believe in the federal government? They are anti-government kooks for cryin' out loud, who "think" they shouldn't have to pay fees to use federal land, or pay taxes. Now, heavily armed kooks thanks to the GOP, ALEC and the NRA. The hypocrisy of the right wing has no bounds. It's anything goes. A group of armed men point loaded rifles at U.S. government employees in defense of a man who has threatened to shoot those employees if they show up at his ranch, and the right wing hails those armed men as patriots and heroes. In the past, such people have always been regarded as criminals. Not only was Sen. Reid correct in callng them domestic terrorists, and I found his chioice of words to be kind. It isn't hypocrisy, Rudy. It is anti-American, and un-patriotic. It is the "new" GOP, now our enemy within. Water Boarding is as safe as being baptized ? To kill one duck is dinner , to kill a few million ducks is a statistic . Ah, yes. American anti-America "patriots". Hiding behind their anonymity with threats, innuendo, and intimidation. Utterly childish behavior. Thank you Sarah Palin for bringing out the best in America. Thank you MSM for allowing folks such as Sarah Palin the freedom to do what they do best: rabble rouse the tin foil hat crowd. Sarah and her so-called "second amendment solutions" represents a violent, and radical core of the GOP. One that thinks putting gun sights on Congressional member's districts and pictures on a web site and simply says "we're not responsible" when one of them gets shot (as happened here in Arizona). The Republicans crossed a line there, and they are out over it again by supporting welfare queen ranchers like Bundy and his armed anti-government thugs. They need to be called on it- daily, until they cease- or get sane. If Bundy was a democrat and Duh Duh Duhbyas ilk was in charge, he'd be branded a terrorist and a tax cheat by the so-called 'murkin right. You can continue to mischaracterize and demonize anyone you want to fit your narrative but that doesn't change the fact that you just don't (care to) understand what Bundy is complaining about. I am not saying he shouldn't have paid his taxes, which he does for other things. In this instance, he feels that the federal govt doesn't have a right to the land and that Nevada does. He would pay the taxes to Nevada. You portray them as anarchists and nothing could be further from the truth. It's just so typical that you would jump to the conclusions you would to stay in your little partisan bubble. You don't think the feds overreacted? You don't have a problem with this agency having firearms, a SWAT team and snipers? And, again, sorry but Harry Reid acts like he is above them and he's not. His statements rile up the masses and make it worse and if you can't recognize that than it's just another example of your intolerance towards another opinion and your devotion to our govt that grows bigger and more intrusive every day. "It isn't hypocrisy, Rudy. It is anti-American, and un-patriotic." I'm so glad that you have completely full circle and now do exactly what George Bush did – deem just what it is to be a pariot and an American. You don't even see your own hypocrisy in this because your so wrapped up in your partisan bubble. "Take time to understand what they're saying and maybe you won't think these people are evil. Again, they are not anarchists. " Newsflash: This goes for the RNC and all the "outreach" nonsense as well...WE UNDERSTAND THE MESSAGE, WE JUST DISAGREE WITH IT. Get. It. Through. Your. Skulls. The issue is not that we don't understand and have not taken the time to listen or that your message got hidden or missed or diverted on the way to our ears. We hear it...every day, all day. LOUD. AND. CLEAR. We understand it. PERFECTLY. We just DO NOT AGREE WITH IT. Congrats for completely misrepresenting and mischaracterizing the over influence of govt on every aspect of our lives now. The problem is that govt is too involved and people like you think it's a good thing while people like me think it's a bad thing. We are not anarchists and it's typical of you to portray it that way. You always seem to think you know what it's in a conservative's mind yet you take no time to understand why they feel the way they do or what motivates them. You put your own opinions on others and think you are so insightful yet you haven't a clue nor an understanding whatsoever of the other side so that's why you mischaracterize everything and also come up with your own set of facts. Take time to understand what they're saying and maybe you won't think these people are evil. Again, they are not anarchists. There is a certain level of acceptable govt and what we have today just isn't acceptable. It's far over reaching and it needs to be pulled back. You never take the time to explain anything, tom. BTW, I do listen to what many of them say, and I find it to be utterly insane, utterly false, or complete and utter hypocrisy. Try listenling to your own message sometime. This Bigot Bundy idiocy is not about gov't overreach. It's about a selfish, racist liar, whose blather has been disproven at every turn, who has spent 20+ years fighting (and losing) to replace reality with his delusion that he gets to pick and choose which laws apply to him, which laws he thinks are legitimate, when the gov't exists and when it doesn't, all based on how it effects HIMSELF and HIS PROFITS. The BLM gives these welfare ranchers an enormous discount on grazing fees compared to those paid by ranchers who graze on private lands...fees that fall extremely short in helping BLM cover the costs of managing that land...but that's not good enough for ole Bigot Bundy. No no. He's entitled to it for free because something something ancestral land and a bunch of other lies that have been thoroughly disproven. So what's the last resort? "I'm a patriot but I don't recognize the federal government" and "I'm going to threaten violence against my fellow human beings who are just doing their jobs and then throw a nutty and pretend they started it when they take the necessary precautions to protect themselves." It's ridiculous. It's all an elaborate temper tantrum and excuse. And the GOP/Teatrolls propped this guy up for no other reason than that it's convenient for them to rile these anti-gov't blowhards whenever they don't have control over the gov't and can't just run roughshod over everyone else with their theocratic and plutocratic agenda. Freedumb =/= "Everyone else has to leave me alone unless and until I want something from them." Liberty =/= "I get to do whatever I want and nobody can tell me otherwise." Time to start poppin' caps in his cows from a helicopter. How many hamburgers worth of meat do you think we need to rack up before he breaks? "The Republicans crossed a line there, and they are out over it again by supporting welfare queen ranchers like Bundy and his armed anti-government thugs. They need to be called on it- daily, until they cease- or get sane." Indeed they should be called out daily. If this is all that GOPerville has going for them to get out the vote then the GOP is in far greater danger than even I have thought it has been this past decade. This is NO WAY to win a mid term election. Not now. Not ever. You haven't a clue what motivates a conservative. You only think you know. Since I am on the liberals side on many issues, I have taken the time to understand what motivates them. I don't demonize them for thinking differently than me. I don't think that they are evil people and that my side is righteous and holy. You have no idea yet you pretend to know which makes you dangerous. They did indeed rs, if I may jump in. I am shocked that after all of this mostly negative publicity this man is still walking around FREE as opposed to having his arse thrown into jail. I know that if you or I owed the US government $1million that's exactly where we would find ourselves post hast AFTER they seized our assets and sold them off to the highest bidder that is. But not to get off topic, these men are indeed domestic terrorists. They squared off frontier-style against lawful government agentsl they got away with it without being shot like you or I would've been shot under similar circumstances and the GOP has sanctioned their actions.